Michigan State does not want to be in this game. On the hierarchy, this game technically falls behind the Outback Bowl in the stack of Big Ten games, but organizers can choose whichever team they want, so they took Michigan for the Outback instead of the Spartans because they travel better and draw better in person and on TV. Michigan State beat Michigan, so they feel slighted - like they always seem to feel when it comes to the Wolverines. The challenge for the team, then, will be to get over that and focus on what should be a very interesting challenge here. If they aren't mentally ready for it then things could get ugly. The Cougars are coming into this one with their coaching staff intact, but there was no shortage of distractions on that front nonetheless. Mike Leach flirted with Tennessee, and the attempt to hire him was reportedly the last straw for now-former Vols AD John Currie. Now Leach has a contract extension and is firmly in place, but there is always the chance that the flirtation could have rubbed players the wrong way and could lead to a sub-par performance. 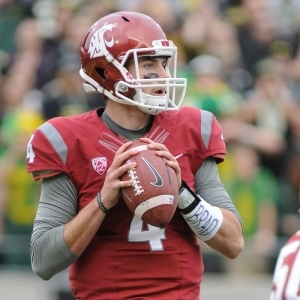 Senior QB Luke Falk gets the attention at Washington State, and he deserves it. He has had another great year at the end of a great career. He faces a setback in that top receiver Tavares Martin Jr. has been kicked off the team. Martin was far from the only option, though - the team had four other receiving options with at least 50 catches - so it would be easy to overstate the required level of concern here. Michigan State ranks fifth nationally against the run, but only 31st against the pass, so Washington State stands a good chance of being able to do what they need to do offensively. Michigan State has struggled defensively against mid-distance passing attacks. Northwestern, for example, torched them on medium-range passes all game. Washington State is more than capable of exploiting that weakness relentlessly, so we will find out early on if Michigan State has adapted effectively. Michigan State can't pass, and Washington State is a Top 10 pass defense, so we can't really expect too much to happen through the air when the Spartans have the ball. QB Brian Lewerke has improved, and has had some luck with deep passes, but it's still far from a strength. It will all come down to Michigan State's ability to run the ball. L.J. Scott started really slowly running the ball this year , but he has come around, and you can run against the Cougars. Your faith in Michigan State's running game will shape how you bet this game. The game opened widely with Washington State favored by the key number of 3, with 3.5 available in some spots. That number really didn't sit well with early bettors, though. Nearly three-quarters of bets were on the Spartans, so the line has fallen to two points. Given the unbalanced action, we could see this one fall even further barring major news. The line opened at 45 and has crept up slightly to 46 . The Cougars are 7-3 ATS in their last 10 games overall and 5-2 ATS in their last seven against teams with winning records. They are just 1-5 ATS in their last six games against the Big Ten, however, and have failed to cover in their last four Thursday games. They have gone "under" the total in five of their last six nonconference games. Michigan State has covered the spread in their last four bowl games, and they are 6-1-1 ATS in their last eight neutral-site games. They are, however, a dismal 3-8 ATS in their last 11 nonconference games. They have gone "over" the total in four of their last five against the Pac-12 and in five of their last seven bowl games. Michigan State has really overachieved this year, and I just don't think they can really play up to their record. They have benefited from being able to play games that suit their strengths. That won't happen here. Washington State shakes things up on both sides of the ball compared to what the Spartans are used to, and they are very likely going to have near perfect weather in San Diego to work with. Mike Leach is going to get creative, and the Spartans won't be able to match blow-for-blow. I really like the Cougars at less than a field goal given up. They are the pick against the spread. Are you ready for some football winners? Doc's Sports has you covered! We are offering new clients $60 in free picks - these are actually members' picks from expert handicappers who live, breathe and eat college football and have years of successful betting/handicapping experience. Click here for the no-hassle sign up page (no credit card required) . Get free weekly free college football picks at Doc's Sports free football picks page .